Take a look at 17 spectacular mehndi design for hands to flaunt this Navratri! Navratri celebrations are in full swing. The Garba, pujas, music, fasting, feasting, all the dressing up in ethnic attire, bangles and bindis that matches the outfit. Oh! The festivities associated with Navratri and Durga Puja marks the beginning of the most amazing Indian festival season such as Dussehra, Karwa Chauth and Diwali! So, have you got your hands and feet decorated with beautiful mehndi designs yet? If not, don’t you worry because Zuri has handpicked 17 stunning and intricate mehndi design for your hands that are truly inspired by Navratri. Mehndi isn’t just for a bride. It’s actually for all the ladies out there, young or old who want to celebrate life. Besides, mehndi is an integral part of our rich Indian culture. And, because it is linked with celebrations, that’s why there are all sorts of designs, patterns and styles to flaunt at various occasions, e.g. special motifs to wear on Eid, Teej, Raksha Bandhan, Diwali, more complex designs for a Dulhan (bride) for her special day and Karwa Chauth mehndi designs could vary from being simple to intricate. At weddings, a bride generally opts for Rajasthani or Marwari style of mehndi. This particular style involves representation of folk and traditions related to Indian heritage. There are flowers, vines, paisleys, peacocks and maharani-maharaja motifs represented through mirror reflecting art. Yes! Indeed, mirror-reflecting because the exact same design is replicated on the other hand/foot. 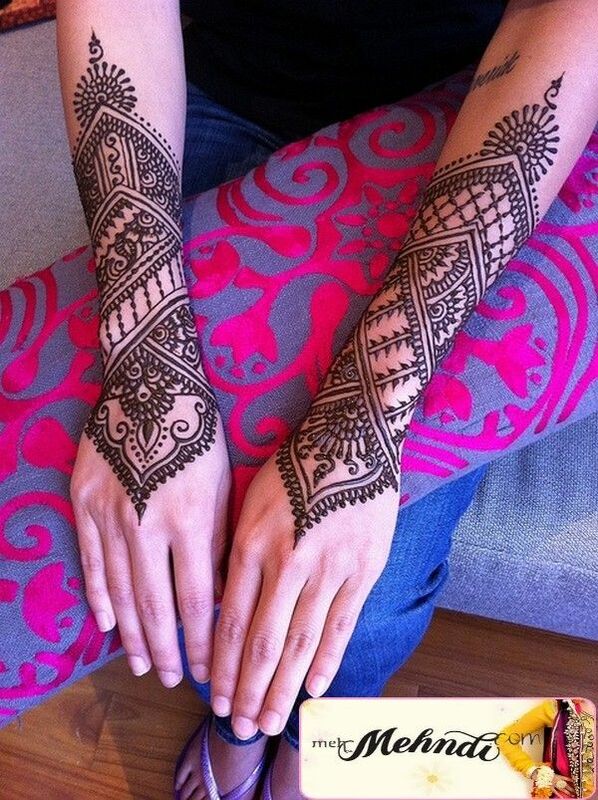 Arabic mehndi on the other hand usually has minimalist designs and free-flowing patterns to show-off. The color of henna paste used in mehndi application is dark-ish. So the stain it generally leaves behind is anywhere between dark-brown-to-black. These designs are easy-to-do at home as well. The motifs are uncomplicated, rather very simple and typically stretches from the wrist to say the length of a finger. The flexibility you get on getting Arabic mehndi done is (i) you save on time and (ii) you need not have your entire hand decorated in mehndi. 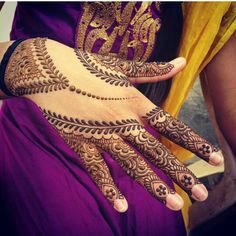 You can get away with getting the back of your hand or the wrist or/and fingers covered in the unique mehndi design. Ideal for a bridesmaid, the Arabic mehndi designs are neither too full nor too messy. One can also embellish the design with studs, sparkles, and glitter. 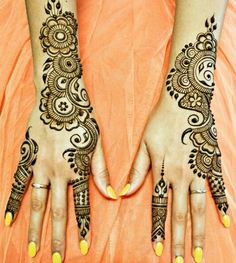 There are other types of mehndi designs as well, for instance African and Pakistani styles that are gaining popularity across the globe. They are equally eye catchy, distinctive and stylish to flaunt this Navratri. So, if you are planning to decorate your hands with mehndi, we recommend you show these pictures to your mehndi artist and ask him/her for the same design with minor tweaks here and there. You can also customize it as per your requirements. Ladies! Go creative this Navratri and have lots of fun!